← Will Obama’s energy plan save you money? 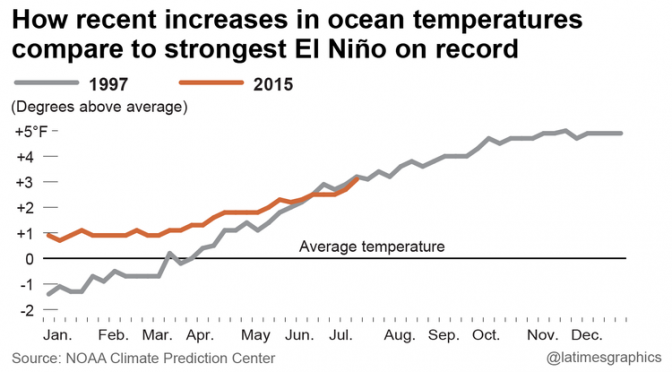 On July 15, a key area in the Pacific Ocean measured 3 degrees Fahrenheit above average. It’s very similar to the reading taken on July 16, 1997 of 3.2 degrees F above average. 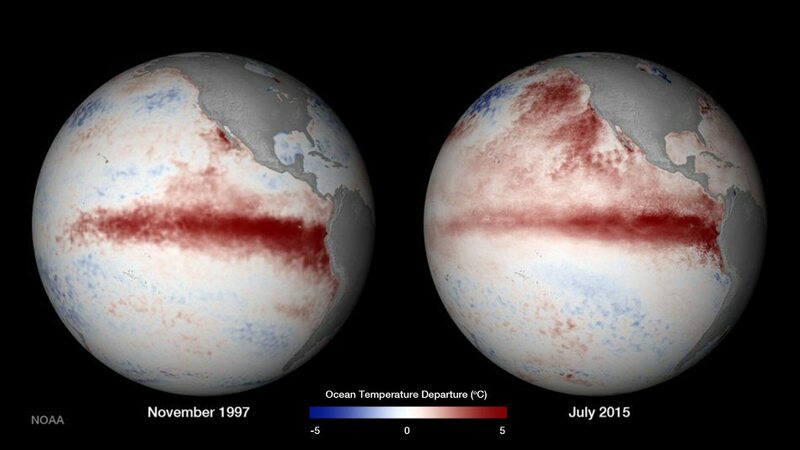 That has experts concerned, because the summer of 1997 ushered in the strongest El Niño in the modern record. In December of 1996 Nevada City got 33 inches of rain and January of 1997 28 inches. The average July to June rain fall average is 55.8 inches. In two months in the winter of 1997 Nevada City got 61 inches of precipitation, more that the average for a total year. One thing to watch is the warm blob off the coast of Washington, Oregon and California. It did not exist during the winter of 1996-1997. Scientist do not seem to know how this warm blog of ocean waters will impact the winter of 2015-2016. It might mean more rain and less snow, or it could mean more snow than usual. Stay Tuned. This entry was posted in California, Climate Change, Drought. Bookmark the permalink.